I drew a very good antelope tag this year. The chance of killing an exceptional buck were high, and if not for some bad luck that may have happened. It takes about 10 preference points to draw this unit, and it just so happened that a few other good friends were also sitting on a pile of points. So we all put in as a group. Two weeks before the season we went up and picked out some water holes. Then set up mock blinds with t-posts and burlap to give the antelope a chance to get used to seeing "something" by their waterhole. Two days before the season we swapped out our mock blinds for our real blinds and then just waited...and waited, and waited, which can often times be the whole story when antelope hunting! One of the greatest things you can do if you're going to spend time in a hot blind is lay down a carpet! It keeps the dust down, keeps the bugs out, and allows you to lay or kneel down comfortabley. It also tremendously helps you to move about quietly. I bought this carpet at Home Depot for $17.95. It turned out to be the best thing I did on this entire trip. When you're in a 100 degree blind for 15 hours a day you need all the comfort you can get! There was an incredible amount of does and fawns coming in to the water hole. I had antelope bedded within 50 yards for the majority of the day. The wind was howling the first day. It was blowing so hard that water was coming out of the top of the water tank and pooling on the ground. Some of the spookier antelope chose to drink off of the ground, as far away from the blind as they could get. This turned out to be a problem, as you'll see in a little bit. At the end of the first day this great buck came in to my waterhole. He drank out the puddle on the ground like the small buck in the above pictures. I had to get off of my chair and reposition myself in the blind, I had to shoot off of my knees, which is not a problem. I had taken off my boots and set them against the wall of the blind. I did not know that one of my boots fell off of the wall, and when I shot at this buck my bottom limb hit the boot. My arrow about did cartwheels and thankfully it missed this buck without wounding him. So I just watched him walk away. I also had some other visitors come to water. I rarely go two minutes without checking what's coming in, and I almost NEVER sleep. But on the third morning of the hunt I was getting tired. Before it was light enough to shoot I thought I'd just lie down for a bit and then get back up. Well I have no idea how long I slept for, but when I woke up I had this guy bedded down about 30 yards away. Did the big one come in while I slept??? I guess I'll never know. Three days in a hot blind can do crazy things to a guys mind. With a busy archery store to get back to and a ten month old son at home I started to look a little harder at some of the smaller bucks. When this guy came in to the water hole I asked myself if I would be happy to shoot him and the answer was a resounding YES! So I shot at the 41st antelope to drink from my tank in two and a half days. 100 yards later there he lay. 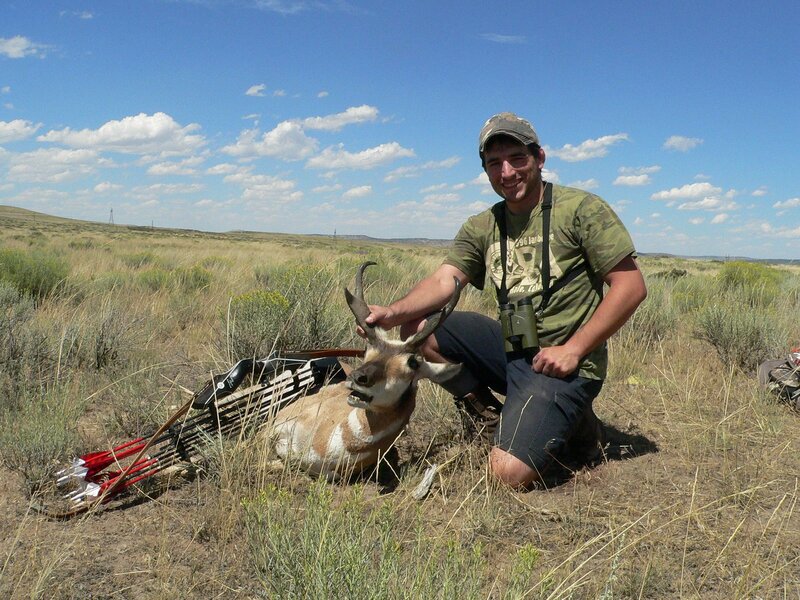 This was my first antelope. I used a 59# Hawk recurve and a Snuffer broadhead. 200 grains up front, and 550grains of total arrow weight. My arrow passed through the antelope and never slowed down. The antelope only ran about 100 yards. I was pleased with my results. Tracy was one of the other hunters that came on this trip. He had maybe the worst luck of all of us. For three straight days, 15 hours a day, Tracy sat in a 100 degree blind without a single antelope coming within 500 yards of him. On the fourth day, after everybody but him had killed a buck, Tracy went and sat on the waterhole I was on. About noon this great buck came in, and Tracy's long wait was over. Tracy was shooting a Hummingbird bow by Ben Graham. So there was this other guy, a friend of a friend type of thing who drew the same tag as us. He ended up sharing camp with us. It was a great surprise to see that Todd was a traditional shooter. I wound up immensely enjoying his company. We talked all sorts of bows, broadheads, you name it. Todd shot this on the 5th day of the hunt. Todd shot a Voodoo longbow, the riser was actually made out of an elk antler of all things. On this first day of the hunt Brandon shot this great buck. He was the first in our group who was done, about 4pm on the first day. Brandon is one of the most accomplished hunters and best shots around. He shoots a Matthews. and bookmark this blog.i hope you will be published more different topic about hunting purpose.thanks.